From the moment your plane breaks through the clouds on its final approach into the small regional airport of Leknes, you realize the dramatic beauty and incredible diversity of the archipelago of Lofoten. It’s as if the Norse gods carefully planned each detail of what makes this small slice of our planet so breathtaking and unique. The perfect storm of coincidences starts with its northern location. Lofoten lies between the 68° and 69° parallels north, placing it in the arctic circle, known for freezing temperatures and midnight sun. 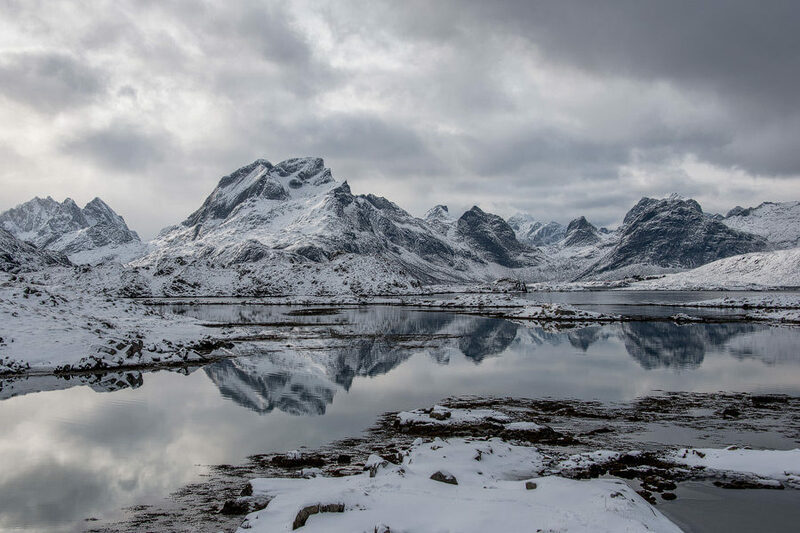 However, you may not even need your sub-zero parka as Lofoten is warmed by the gulf stream, keeping it a comfortable 27°-37° Fahrenheit (-3°- +4° Celcius) during our tour. The days start growing longer in February as well and the sun arches low across the sky, providing the perfect light for landscape photography all day long! And the landscapes…words cannot describe them, but we’ll do our best. Chiselled peaks rise from the clear waters of the Norwegian sea as if they were summoned by Odin himself, creating a maze of inlets and fjords at every turn. These seemingly endless mountains of dark stone outlined by fresh white snow serve as the quintessential backdrop of each Lofoten landscape. Standing on the rocky shores of stone polished from millennia of crashing waves, you can imagine the sails of Viking Longships passing by, returning from a voyage of exploration or conquest. 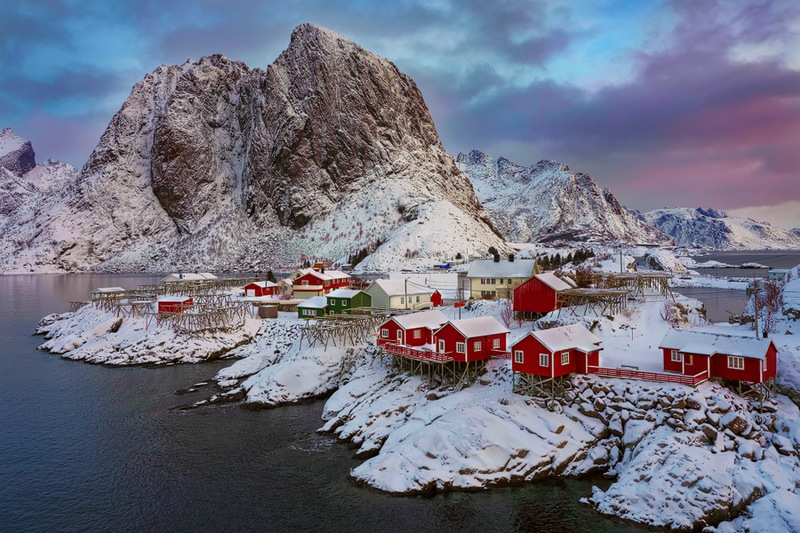 As we venture to the southern regions of Lofoten, we are transported back in time to the red fisherman cabins used for hundreds of years by the Nordic cod fisherman. We not only will capture many of these small fisherman villages during our stay but will also be staying in them as well! Of course, they will have all the modern conveniences you’d expect to keep you warm and comfortable after a long day of shooting. We’ve explored the fjords, beaches, towns and coastlines of Lofoten and found an endless stream of photographic opportunities. Join us and together we will traverse the Nordic countryside in search of wonder, chasing auroras, and basking in the greatness of this land. We want you to leave Lofoten with more than memory cards filled with magnificent photographs. That’s why our tours put so much focus on delivering historical experiences, authentic accommodations and delicious cuisine. So when you show your photos to friends and family, they trigger a memory or have a story attached to them. While journeying through Lofoten we will get a sense of how the rugged landscape and bountiful ocean cultivated such a unique way of life for the Norse. Combined, our team has spent 100’s of hours traversing Lofoten, in search of photography highlights. This tour includes a perfect blend of the postcard images you would expect as well as a number of exploratory areas where you can discovery your own compositions. We will visit and capture the quintessential red Nordic fishing villages of Hamnoy and Reine, venture to the picturesque shorelines of Varied and Uttakleiv and shoot the sun setting over the majestic peaks at Sund. We also have found that some of our most memorable shoots are the roadside stops where our guests are free to explore the area and create their own stunning compositions of the surrounding peaks, fjords and shorelines. And we can tell you, Lofoten is full of them. Our team spent days getting lost in the endless natural beauty of Lofoten’s countryside. Upon arrival in Leknes we will pick you up at the airport and transport you to Hamnoy, the basecamp for our photo tour. There you will join our group and can settle into the authentic Nordic fisherman cabins, called rorbuers. These rorbuers have been modernized to provide all the comforts you would expect and will be a warm and comfortable place to relax after a long day of exploring and capturing the area. This evening our group will meet for a celebratory welcome dinner to kickoff the journey ahead and to get to know one another. Today we kickoff our photography tour with a sunrise shoot! With so many breathtaking vistas right outside our door, the weather and cloud cover will help us decide where to go. This small area of Lofoten offers a variety of nature landscapes as well as the quintessential fisherman cabins below towering peaks. We will also explore the area of Olenilsoya, a hilltop which provides days of subject matter. After dinner we will hope the Aurora gods offer good shooting conditions! After a sunrise shoot around the Hamnoy region (conditions will dictate where) We continue our exploration in the southern regions of Lofoten. Shooting locations today include Gravdalsbukta bay, the quaint town of Reine and random roadside stops of exploration. We will also do our best to schedule a stop at one of our favorite coffee shops, Bringen. Trust us, their pastries and treats are to die for! After a local sunrise shoot, our group heads North, up the eastern coast. We have a long list of highlights to visit today, but will let the weather decide which ones are best! Our list includes the remote village of Sund, miles of Fjords and one of our favorite exploratory areas just south of Fredvang. Schedule permitting we will also make a stop at the Sund Fisherman Museum where our group can learn about the importance fishing has on this remote area of the world. Today we continue our journey North, revisiting areas we may have missed and exploring new ones. As with all days in Lofoten, the ever changing weather dictates where the best photographs can be taken. We will continue to Fredvag beach, Ramberg and Flakstad, with a planned sunset shoot at Vareid overlooking the fjord. If we haven't already captured the elusive Auroras, we will once again hope for the right conditions! Today we head further North to explore Uttakleiv and Haukland beaches on the western side of Lofoten. Only a mile apart and separated by Vasskarvatnet mountain, their differences make them seem worlds apart. If the conditions are right we can hope to see arctic surfers carving the frigid waves and providing us with some unique photo opportunities, making our already breathtaking photos even more fabulous! Upon returning to Hamnoy our group will enjoy a farewell feast, sharing the stories of our journeys together, memories that will not be forgotten. After breakfast we will return to Leknes Airport where will begin your journey home. Upon returning to Oslo International Airport you can catch a flight to your corner of the world, taking your new found knowledge in photography with you, as well as the memories and new friendships that will last a lifetime. We hope to see you again in a far away place where we can share another adventure together, discovering the beauty of our world. During our stay in Lofoten winter is coming to an end and the days begin to grow longer adding almost 10 minutes of daylight each day. However, upon our arrival we have only 8 hours of daylight to explore and shoot, and we want to make sure you are experiencing as much as possible, not sitting at a table eating a meal. Because of this, each of our cabins is equipped with a full kitchen for you to prepare breakfast before we head out for the afternoon. We will make a number of stops at local grocery stores for you to purchase your breakfast foods, snacks and drinks. We will also eat lunch “on the go” rather than spending precious time at a restaurant. Each night, after a long day of shooting our group will meet for a hearty multi-coarse dinner where we can share our stories of the day and discuss our plans for tomorrow. We’ve found this approach maximizes our time in the field and allows you to spend as much quality time possible with our team of photographers. Certainly one of the highlights of our tour, our group stays in an authentic fisherman’s village on the edge of an inlet. 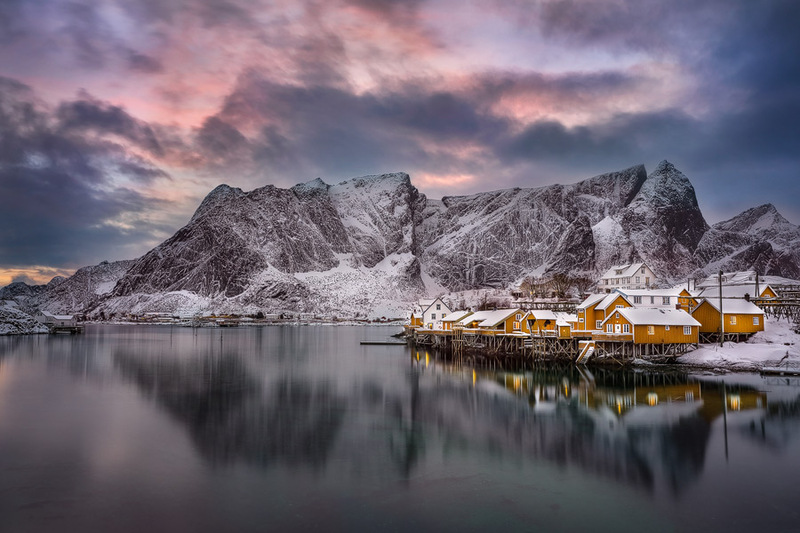 Each fisherman cabin, or “Rorbuer” as they are called in Lofoten, retains the same rugged historical feel that you would expect in Lofoten, however have been renovated with all the modern amenities a world traveler would expect. Equipped with a full kitchen, spacious living and dining room with comfortable furniture and free high speed wifi. Each Rorbuer has 2 bedrooms, each with 2 beds. If you have requested single supplement you will have your own room and will share the Rorbuer with 1-2 other guests. In 2018, my best friend and I decided to combine our love for travelling with our new love of photography. What a great decision that was! As a novice photographer I was a little nervous and intimidated prior to the trip, however Ken and Patrick with their inspiring passion for what they do and witty sense of humor helped put me at ease almost immediately. Norway not only had some amazing landscapes to photograph during the day, but the most breathtaking Northern Lights. One of my favorite memories from this trip was standing out in the middle of the night with all my new friends just watching Mother Nature’s light show. Discovery Photo Tours puts on a 5 Star experience. There is no detail big or small that was overlooked. I went to Norway hoping to check off another place on my list as well as improve my skills as a photographer. What I left with was that and much more. I will forever cherish all the memories, but most of all the wonderful new friends that I made on this trip. So thank you Discovery Photo Tours for making this a trip of a lifetime!! Quel voyage photo! J’ai eu la chance de faire quelques voyages avec Ken et Patrick, mais je dois avouer que celui de Lofoten en Norvège fut le plus mémorable pour plusieurs raisons. Tout d’abord, les paysages. La morphologie de cette région est tout à fait unique et très spectaculaire avec ses sommets pentus couverts de neige, ainsi que les fjords. L’organisation de Discovery Photo Tours a été impeccable. Que ce soit pour la visite des différents sites de « photo shoot » ou pour l’hébergement dans les fameux petits chalets de Hamnoy. Et que dire de la bouffe! J’ai rarement aussi bien mangé lors d’un voyage photo. On nous servait des produits frais de la mer tous les jours. De plus, la gang était fantastique, nous avons bien rigolé et sympathisé tout au long du séjour. Si vous aimez la photographie de paysages, vous adorerez Lofoten avec Discovery! Travel and photography is a combination that naturally comes together. If you love either, then you simply must experience a place like Norway and do it with Discovery Photo Tours (DPT). Ken and the team go out of their way to take your experience to a whole new level. I was blown away by Norway’s landscapes and of course, the northern lights - simply breathtaking! I was impressed with (and valued) all the behind scenes work DPT did to maximise our time enjoying the culture, people, food and photography. And then there was the unexpected friendships made, priceless. This is an amazing country. And Ken is a brilliant tour leader and an even better human. Thank you, DPT! Athena Carey is a multi-award winning fine art travel photographer specializing in long exposure and black and white photography. She is widely recognized for her ability to capture the emotional essence of place and time within her images.